Property Location Located in New Braunfels, Hill Country Cottage and RV Resort is in a rural location and close to Snake Farm and Landa Park. 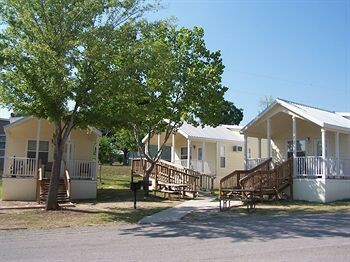 This caravan park/campground is within the vicinity of Schlitterbahn Waterpark and Christus Santa Rosa Hospital New Braunfels.Rooms Make yourself at home in one of the 80 individually decorated guestrooms, featuring kitchenettes with refrigerators and microwaves. Rooms have private furnished patios. LCD televisions with cable programming provide entertainment, while complimentary wireless Internet access keeps you connected. Conveniences include separate sitting areas and coffee/tea makers, and you can also request irons/ironing boards.Rec, Spa, Premium Amenities Take advantage of recreational opportunities offered, including an outdoor pool, a sauna, and a fitness center. Additional features include complimentary wireless Internet access, an arcade/game room, and gift shops/newsstands.Dining Grab a bite from a grocery/convenience store serving guests of Hill Country Cottage and RV Resort.Business, Other Amenities Featured amenities include complimentary high-speed (wired) Internet access, a computer station, and complimentary newspapers in the lobby. Planning an event in New Braunfels? This caravan park/campground has facilities measuring 5000 square feet (450 square meters), including meeting rooms. Free self parking is available onsite.